^ 1.0 1.1 1.2 1.3 Beijing 2008. Paralympic.org. [2013-07-23]. （原始内容存档于2013-05-07）. ^ Design Concept for the Medals of the Beijing 2008 Paralympic Games. Beijing 2008 Paralympic Games. [2013-07-23]. （原始内容存档于2012-08-25）. ^ Medals unveiled for Paralympic Games of 2008. Beijing 2008. 2007-11-14 [2013-07-23]. （原始内容存档于2011-02-21）. ^ 4.0 4.1 Day 12: China biggest winner at Paralympics. Xinhua/People's Daily. 2008-09-17 [2013-07-23]. （原始内容存档于2011-06-05）. ^ Horvat, Karmen. Best Croatian Paralympic Athletes Of 2008. Dalje.com. 2009-02-06 [2013-07-08]. （原始内容存档于2012-11-13）. ^ Dambadondog wins Mongolia's first ever Paralympic medal. Beijing 2008. 2008-09-14 [2013-07-23]. （原始内容存档于2009-04-22）. ^ Osamah wins Saudi Arabia's first gold. Beijing 2008. 2008-09-08 [2013-07-23]. （原始内容存档于2009-02-07）. ^ Yip's year: A sweet sixteen. Beijing 2008. 2008-09-17 [2013-07-23]. （原始内容存档于2012-04-16）. ^ Venezuela sports minister hails Beijing Paralympics as "perfect". China Daily. 2008-09-15 [2013-07-23]. （原始内容存档于2010-07-11）. ^ 2008 Medal Tally. ABC. [2013-07-23]. （原始内容存档于2008-10-26）. ^ Daniel Dias. Laureus. [2013-07-23]. （原始内容存档于2012-10-28）. 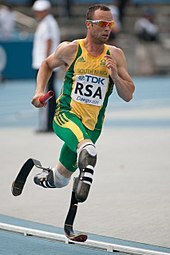 ^ Paralympics 100m: Oscar Pistorius says past experience vital. BBC Sport (BBC). 2012-05-21 [2013-07-23]. （原始内容存档于2012-09-15）. ^ Final medals table. BBC Sport (BBC). 2008-09-17 [2013-07-23]. （原始内容存档于2012-09-06）. ^ 14.0 14.1 IPC Historical Results Database. Paralympic.org. [2013-07-23]. （原始内容存档于2013-07-03）. ^ S10级女子100米仰泳：索菲·帕斯科和希琳·萨皮罗共同夺冠_2008北京残奥会. 新华网. 2008-09-13 [2013-07-23]. ^ Davies, Gareth A. Rebecca Chin stripped of Paralympic silver by 'failing' system. Daily Telegraph. 2008-09-15 [2013-07-23].